Do online reviews really matter, and do they make a difference to your business? The answer is yes, they absolutely do. Consumers increasingly use reviews left by other consumers as part of their pre-purchase research efforts, and a bad review can have serious effects on your sales. Herd shopping psychology plays an ever effect on consumers’ behavior online. Groupon is a wonderful example of that, with deals kicking in only if a certain amount of people pay for them. Research shows that the more people have already opted in on a deal, the likelier it is new visitors will commit to it. User reviews are not so far removed from this phenomenon. Over 80% of people said that positive reviews would encourage them to purchase a product. The same number of people changed their minds about purchasing after reading as little as one or two negative reviews. Unfortunately, fake reviews exist, and they exist in a massive abundance. Competitors have been known to leave bad reviews on products posing as disgruntled customers, That is why more needs to be done to help consumers identify a fake review. You are bound to get a negative review at some point during your business career. That’s simply the reality and nature of the world. It can be devastating for a business, but most people recognize that everyone makes mistakes. A couple of bad reviews aren’t going to put the nail in your coffin and close your business down. 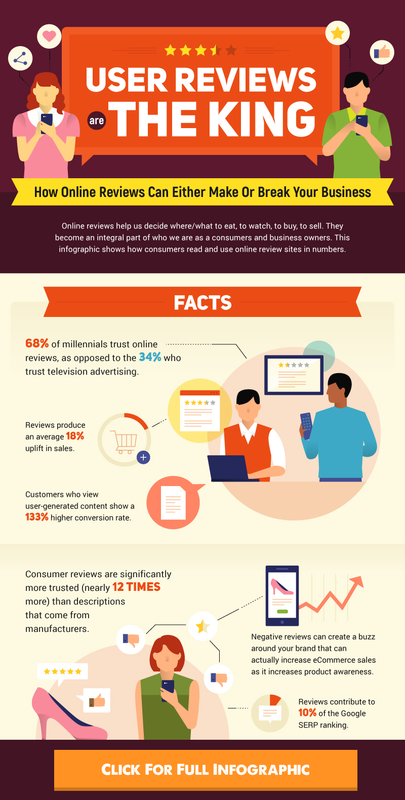 Consumer reviews are more trusted than descriptions that come from other manufacturers, nearly 12 times more. 90% of consumers read less than 10 reviews before forming an opinion about a business which means these decisions being made are made quickly, without much hesitation. The top five industries to be affected negatively by online reviews are restaurants, hotels, doctor’s offices, hospitals and hair salons. Negative reviews aren’t all bad; these have been known to create a buzz around your business and increase its exposure, unlike fake reviews that have been so outlandishly obviously fake and ridiculous that they go viral. Want to learn more about how online reviews can make or break your business? Check out our infographic. 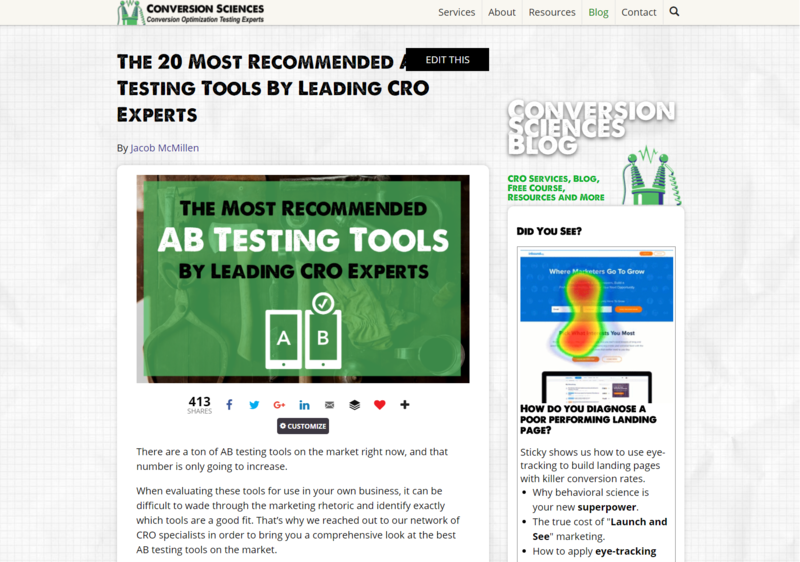 https://conversionsciences.com/wp-content/uploads/2018/06/Do-Online-Reviews-Really-Matter_blog.jpg 740 1200 Josh Wardini https://conversionsciences.com/wp-content/uploads/2018/11/conversion-sciences-conversion-optimization-agency.png Josh Wardini2018-06-07 08:00:172019-01-15 20:11:24Do Online Reviews Really Matter? 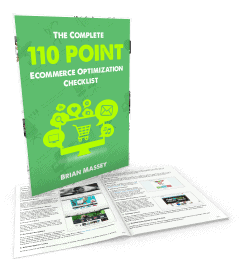 You want to optimize your ecommerce site, but where do you begin? What do you look for? What page elements are worth evaluating? At Conversion Sciences, we have a checklist that our team goes through when evaluating a new client website, and today, we’re going to share that checklist with you. This checklist includes virtually everything you’ll want to consider optimizing while putting together your own A/B testing campaign. This is not a list of everything you should test. It’s a list of everything you should consider testing. Optimizing an ecommerce site requires strategy and prioritization. It would take an eternity to test every single item on this list using proper testing procedures. 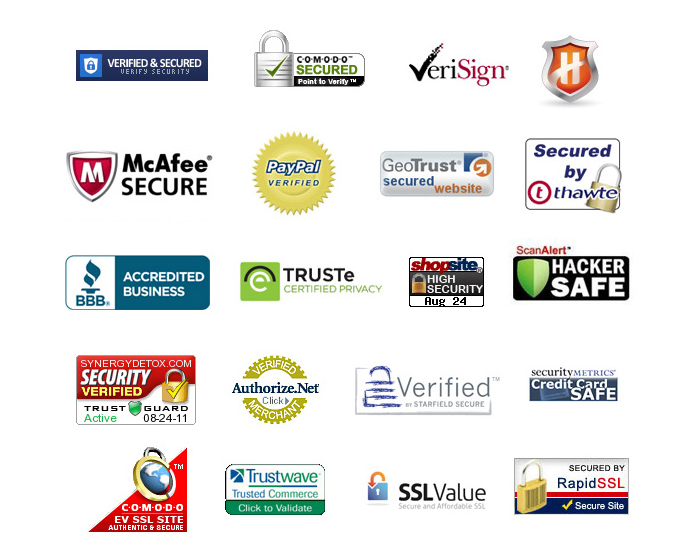 But if there is anything on your site worth testing, I can tell you with 99% certainty that it’s on this list. To make navigation easier, we’ve broken our ecommerce optimization checklist into 8 distinct categories. Select the category you wish to optimize in order to get started or simply scroll down to start with item #1. Sticky elements are items that remain fixed on the screen as the users scrolls up or down. The most commonly stickied page elements are the header navigation bar. 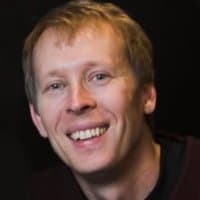 Stickied elements tend to attract focus and distract from other page elements, which means they can work both for and against you and should be including in your testing. Dropdown menus are pretty straightforward and a staple of ecommerce sites and websites in general. They offer a quick understanding of the site’s information architecture and ready access to subcategories. 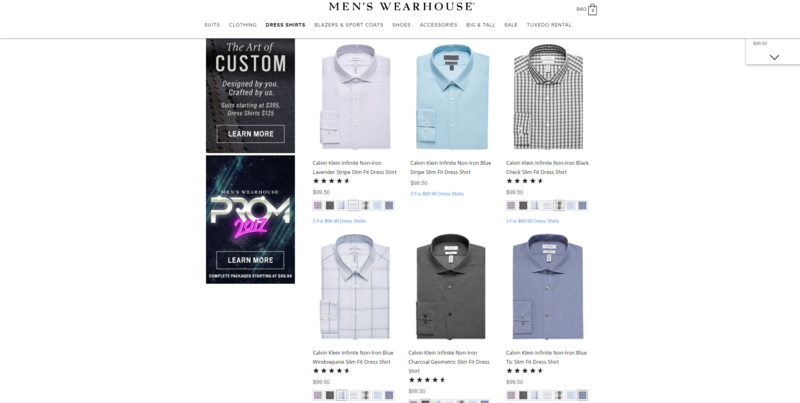 If you look at many of the largest online retailers, you will notice that certain dropdown menus expand into large fields with more items and added visual elements. We called these “supernavs” here at Conversion Sciences and they can be a powerful tool for highlighting specific offers, deals and product categories. They can be difficult for a visitor’s eyes to parse, so use carefully. Should your dropdown menus open as soon as the user’s mouse cursor hovers over them? Or should they activate upon an actual click? It may not seem like a big difference, but it’s a potential item to test for. If poorly implemented, they can be a barrier to site navigation. One of the most common problems we encounter is sub-optimal navigation ordering. Categories aren’t properly selected and ordered. Menus and menu item placement seems almost random. 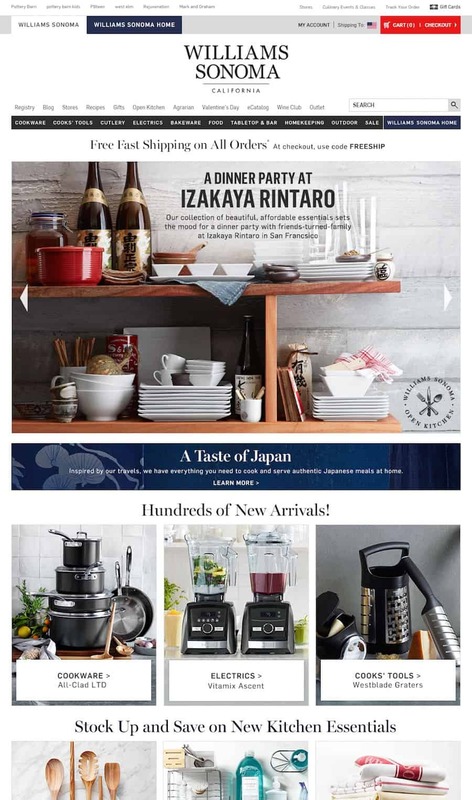 There is an argument for placing the most clicked navigation items toward the left or top. 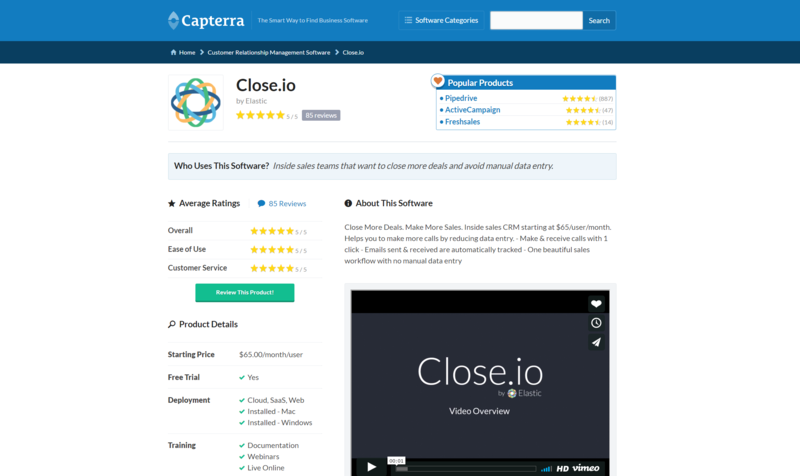 You can determine this using a heatmap report from CrazyEgg, HotJar, ClickTale and similar user testing tools. Another common problem we encounter is a lack of obvious navigation links to popular products or product categories. 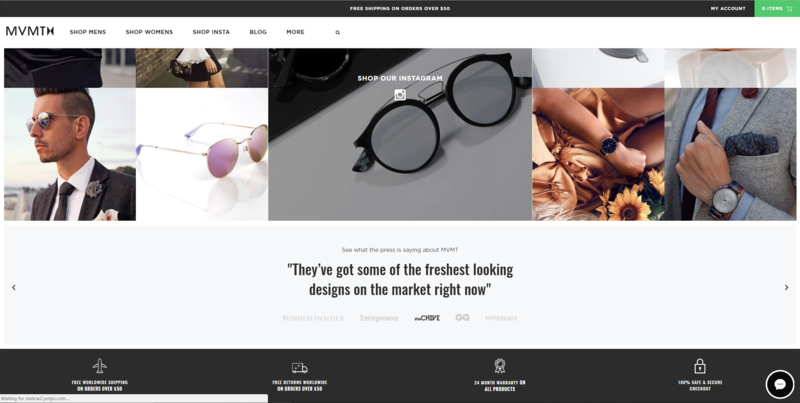 Ecommerce stores include feature images and headlines somewhere on the front page, but forget that they need to be added to the primary menus as well. Redundancy is not a vice, and when discussing your bread and butter products, it’s typically a virtue. Your main navigation communicates your offering. Choosing the right words helps those who never click on your navigation. When testing navigation language, it is common to see an increase in conversions but no increase in clicks on the navigation elements we’re testing. Navigation is a way to communicate your value proposition and offering. After determining that all the right links are present, look at the word choice for each link. Is there a more accurate or intuitive way to define that category or other link heading? Could you be more specific? More general? 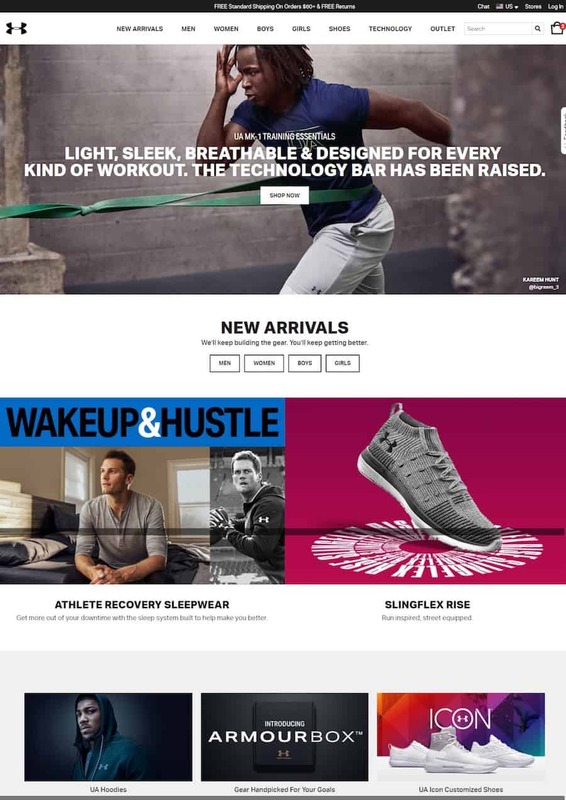 Are certain categories selling like crazy when the user enters the website directly via the product page but rarely being clicked on via navigation? Visual cues are visual elements that point the eye in a specific direction. Make sure that your visual cues are working for you rather than against you. It’s amazing how many ecommerce websites completely lack any discernible value proposition. While creating a unique value proposition can be a bit more difficult for stores offering numerous products, it doesn’t mean you should skip it altogether. Look for ways to define your value and pitch why visitors should continue shopping on your site at every opportunity. Quickly give the visitor a reason to stay. Are you the cheapest, highest quality, or do you have the biggest selection? Do you have a generous return policy or warranty? Do you serve a niche in the marketplace? Do you have a unique brand voice? 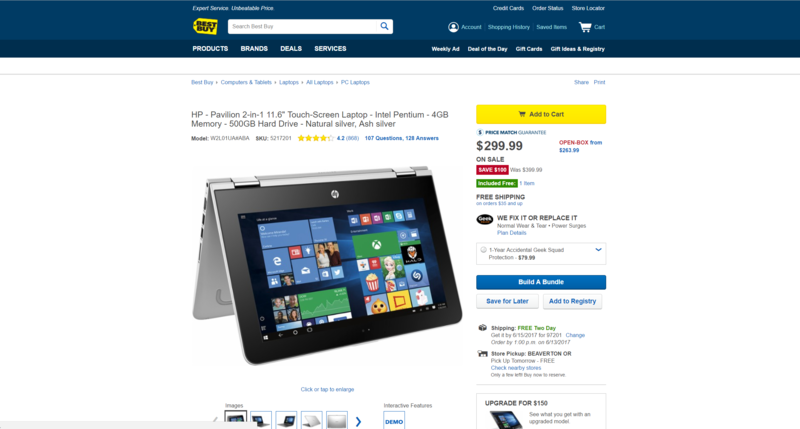 When a customer clicks on that shopping cart icon in the navigation bar, what happens? Are they taken straight to the checkout page or does clicking trigger a dropdown or modal display? Customers wishing to review their shopping cart might prefer a dropdown. Customers wishing to get straight to checkout might be annoyed by the extra click. You’ll need to test to know how your visitors are responding. Pro tip: Be sure to instrument your cart dropdown or overlay for tracking by analytics. It’s part of the purchase funnel. 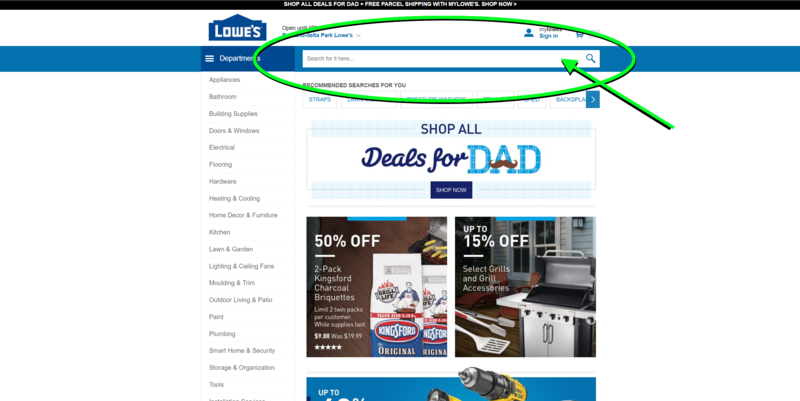 Similar to navigation dropdowns, the search bar is a huge part of how visitors interact with an ecommerce website. Should yours be bigger? Should the written prompt be different? How should it fit into your layout? These are all important questions to ask when evaluating your overall navigation layout. Upselling will reliably increase your average order value. Are you suggesting alternative or related products to browsers within your search algorithm? Where and how are you suggesting those products? If a visitor doesn’t find what she’s looking for in the body of a page, she will return to the top of the page. Your header should provide a next step. In its lonely home at the bottom of the page, footer elements don’t get seen as much by visitors. This is usually the basement location for search optimization copy and keywords. It can also be the last resort of a frustrated visitor. Consider all of the elements you would consider for the header. Check your heatmap reports as well. You might be surprised by the number of clicks you’re getting in your footer. 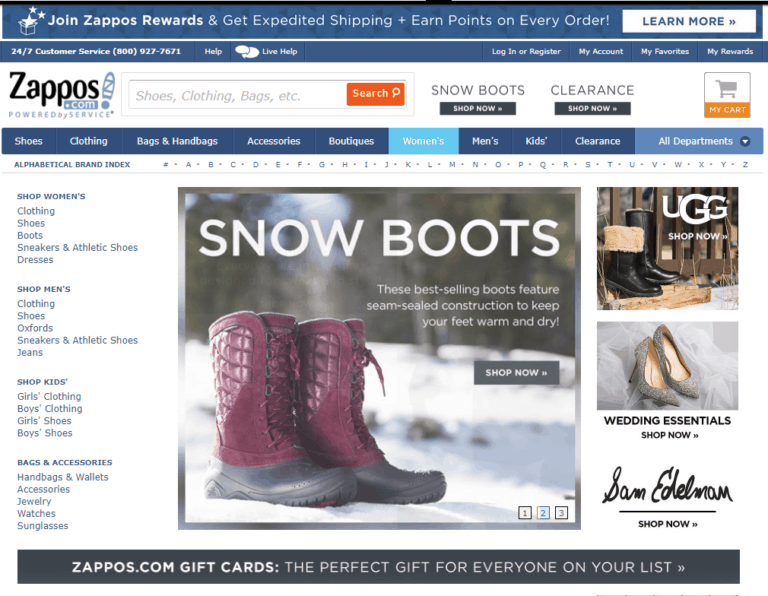 A group of power shoppers was recently discussing the retargeting ads delivered by one major apparel retailer. They unanimously decried the ads that featured a desirable product, and then dropped them on a page that didn’t have that product. Keep the promises you make to your visitors. What can you offer visitors coming in from different traffic channels? Are they directed to channel-specific pages? Are they served dynamic content? This can have a massive impact on your success in converting users from each channel. Email subscribers purchase at a significantly higher rate than social followers or new browsers. The question is how do you attempt to attract new subscribers? 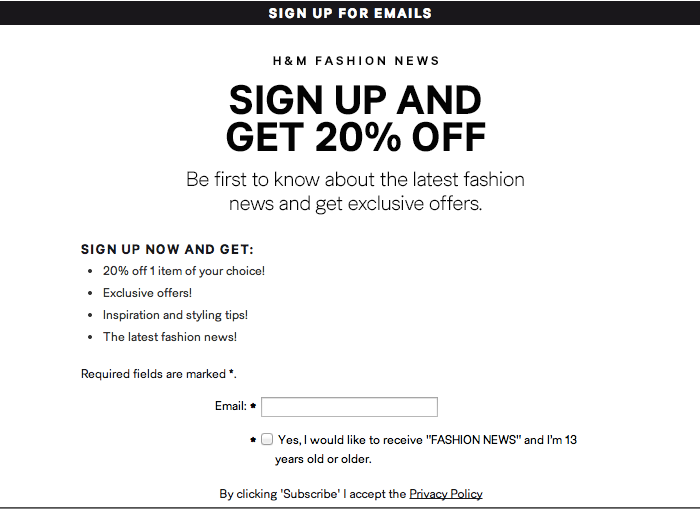 While users claim to find them annoying, popup modals tend to be very effective at converting visitors to subscribers. 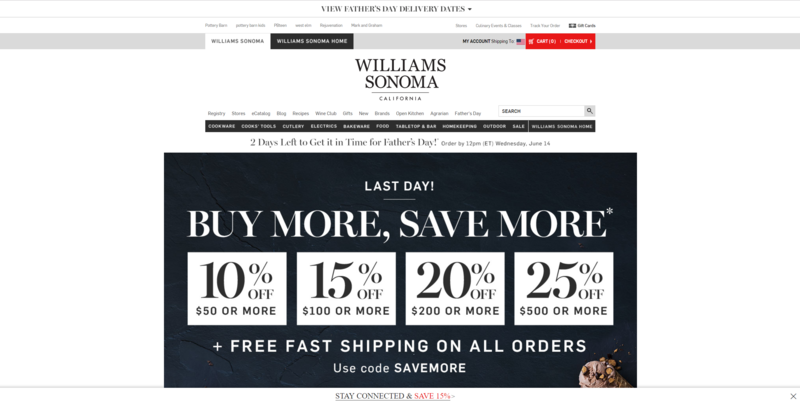 For ecommerce sites, one of the most effective types of modals is the discount modal. Users are already there to buy. Accepting a discount is a no-brainer. Live chat has become an effective tool for eCommerce stores. It can be auto-prompted or offered in the Help section, and it’s definitely on the list of things to test. 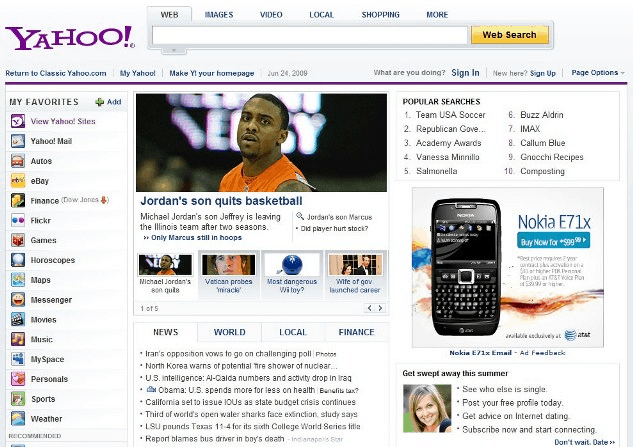 Your homepage’s hero shot is the above-the-fold area incoming visitors see as soon as they arrive. It’s one of the most important pieces of real estate on your website, and a top priority for split testing. 20. Dynamic or Static Heroes? Should you utilize dynamic elements like sliders or other moving graphics? Or should you keep the page static? It’s important that you catch visitors’ attention here, but what that attention catches on is equally important. Rotating carousels slow load times and only improve conversion rates if ordered properly and times perfectly. Large video backgrounds can bring a page to its knees, making the site seem slow and cumbersome. 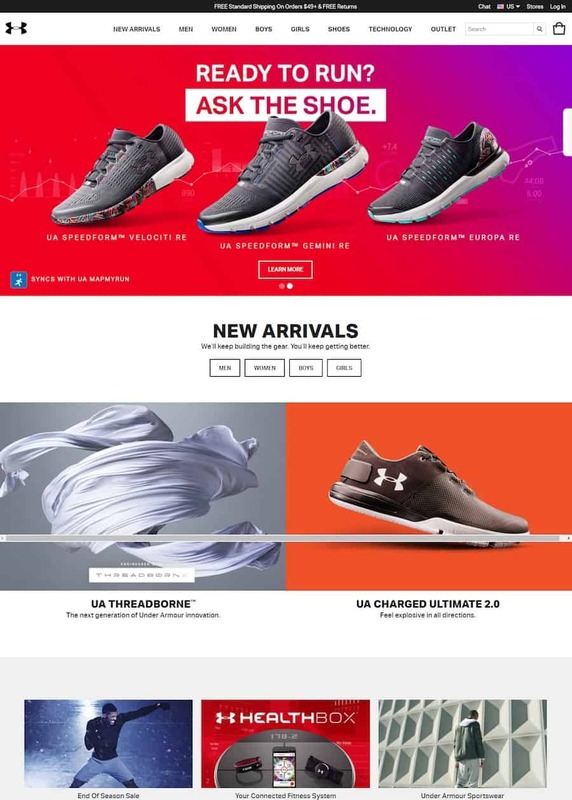 While many sites choose to keep their navigation consistent across the entire website, if there is any page where customization can be beneficial, it’s the homepage. This is the gateway to your business, and experimenting with different looks and functions on this specific page can be beneficial. Just like you need to emphasize your value throughout the website, it is especially important that you present unique value on the homepage, and more specifically within the hero shot. 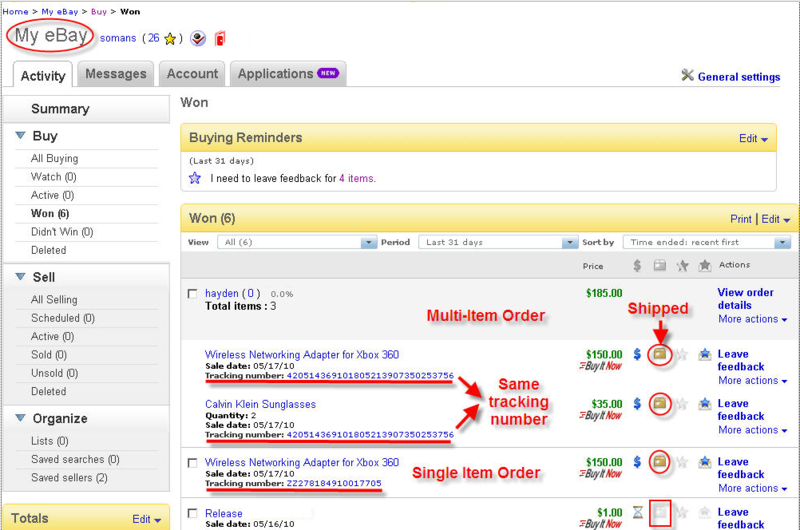 Some ecommerce stores emphasize quality. Others emphasize price. Others emphasize special offers like discounts or free shipping. You’ll need to test to know what works best with your audience. 23. Should You Add A Video? Promotional videos provide a fairly consistent boost to website conversion rates, although I have yet to see many examples of them being tested on eCommerce stores. If you are struggling to differentiate your brand, it’s definitely something to think about and consider testing for. Be cognizant of increases in load time. Does your homepage have a primary Call to Action (CTA) or a handful that stand out? If so, how can those be optimized? If not, should you have one or more? 25. Should You Highlight Popular Products? Should you highlight popular products or products you are looking to push? How prominently? Where on the page? 26. Should You Highlight Special Deals? If you are advertising a promotion in the marketplace, your main landing pages should mention the promotion. 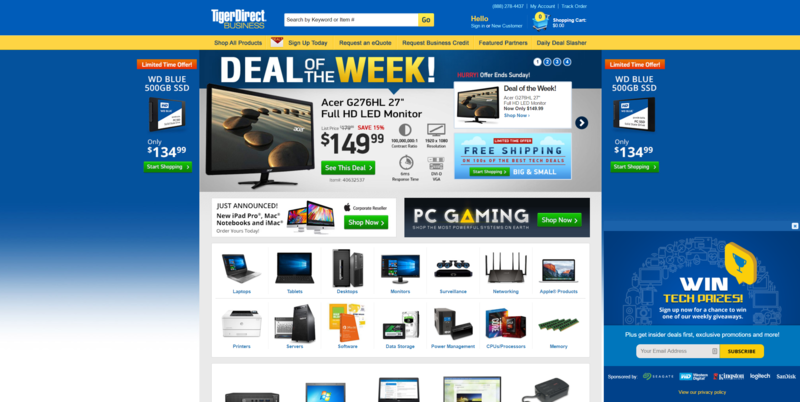 You can highlight special deals on the homepage, category pages, product pages, and even in the cart. Consider a small deals bar, big hero shot, or sidebar displays. 27. 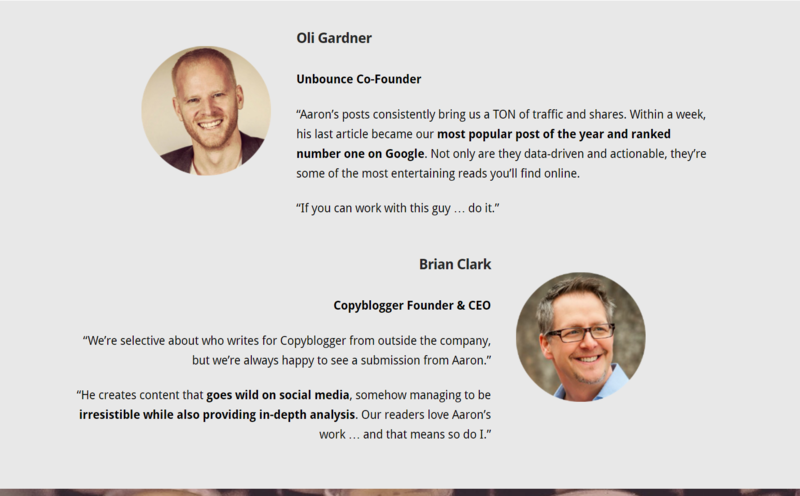 Should You Include Testimonials? Customer or influencer testimonials can build trust and advance the value proposition on almost any page of the website. 28. Should You Highlight Top Categories? Should you promote specific products or highlight product categories? Should they be displayed in your hero shot or somewhere else on the page? Faceted search allows browsers to adjust their selection criteria on the fly, allowing for very customized searches. If you offer a large inventory and don’t have faceted search, it’s something worth re-evaluating. Consider testing the order of faceted search categories. Also play with unrolling some categories in the facet menu by default. Sidebar navigation is one of those things that can help or hurt. While sidebar lists can guide a visitor to the products they are looking for, the tyranny of choice can make a page overwhelming. Sidebar navigation may help on some pages and hurt on others. Our testing indicates that it really depends on your site and your audience. In general, more detailed images perform better than stock manufacturer images. 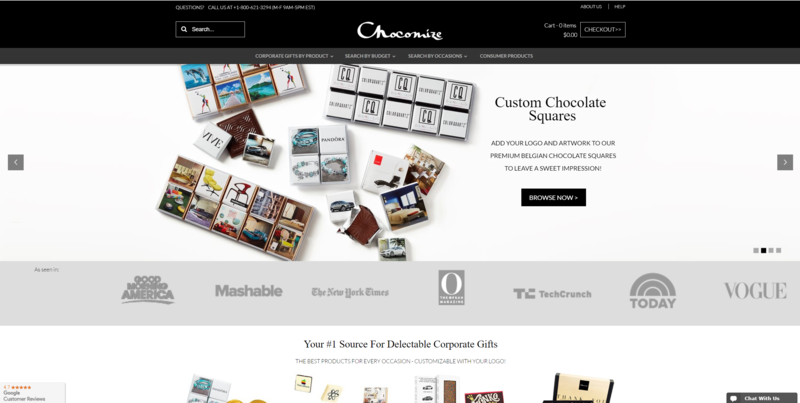 Ecommerce layout is all about maximizing the value of limited space. Are your images too small to make an impact? Are they too big, obscuring other important information? Should you just list your categories or include CTAs to prompt entrance? Are your category CTAs effective or do they need to be improved? 33. List View or Grid View? On category and search results pages, visitors will have a preference for grid layouts or stacked list layouts. List layouts are easier for comparison. Grid layouts fit more products onto the screen. You may give visitors an option. 34. Modify Row & Column Count? For sites with heavy traffic, sometimes something as simple as modifying the number of rows or columns can impact your conversion rate. Should you have 8 products per row or 3? Deciding what to display on category pages is critical and worthy of a series of tests. What product information should you display with each item? The options are almost limitless. Every audience will react differently. 36. What Type of Information Should Be Filterable? There are many different ways to classify and categorize products. If you don’t offer enough filters, you can make searching difficult for users. If you offer too many options, you can create unhealthy friction in the browsing experience. 37. Endless Scroll or Pagination? Do you break categories with hundreds of options into pages or do you use endless scroll? Most large retailers currently use pagination, but that doesn’t mean it’s the right choice for every eCommerce business. 38. Should You Include Special Badges? Editor’s choice, top picks for 2017, new items, bestsellers etc. Should you include special badges or keep all things equal? Your primary product image might just be the most important single element of your product page. Does the image optimally display the product? Is it high quality? Is it big enough? Where should the Add to Cart or other CTA button go on the page? How big should it be? What color should it be? What should the copy say? Where should you list the price? How big and bold should it be? Should you make it look discounted even when it isn’t? 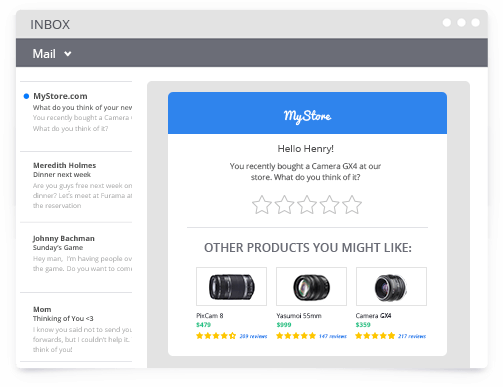 User reviews have become a core part of eCommerce, as modern consumers place more and more weight in feedback from other consumers. Should you display reviews or ratings? If so, where? How obvious should they be? Should you only show reviews if they meet a certain threshold? Should you dive right into the product description or include a one or two sentence product value proposition? Are your shipping and return policies obvious or hard to find? Do they encourage trust in your brand or make users skeptical? Weak policies can result in lower conversions, particularly with first-time customers. Are you including a sizing chart to help potential buyers understand your product dimensions? If so, is this enhancing the user experience? If not, should you add one? 46. 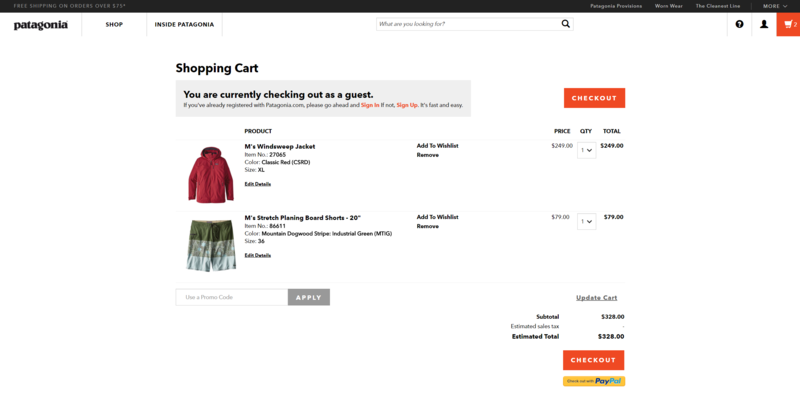 Cart Success Modal or Navigate to Cart? 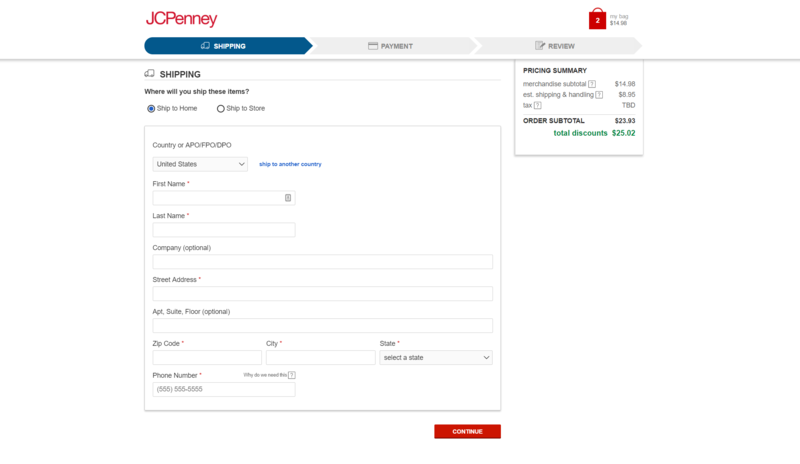 When a customer selects “Add to Cart”, does a modal popup or does it take them off page and directly to checkout? 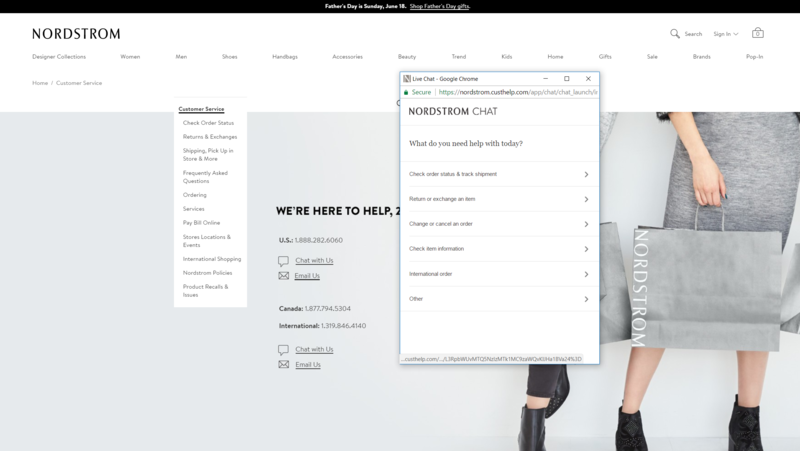 Modals tend to make it easier for users to continue shopping, while direct checkout navigation is more streamlined when you are expecting a single purchase. When users are looking at a product, are you suggesting related or alternative products for them? 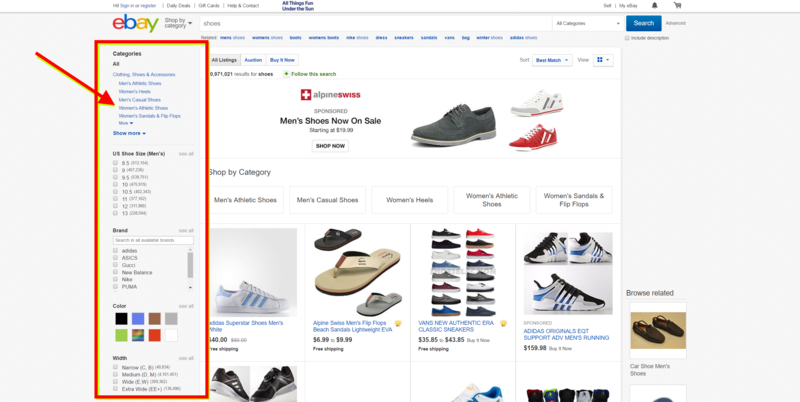 This is Amazon’s #1 methods for increasing cart size. We believe that the Product Page should provide all of the information necessary for the visitor to buy. How you fit this information onto the product page is a question worthy of testing. 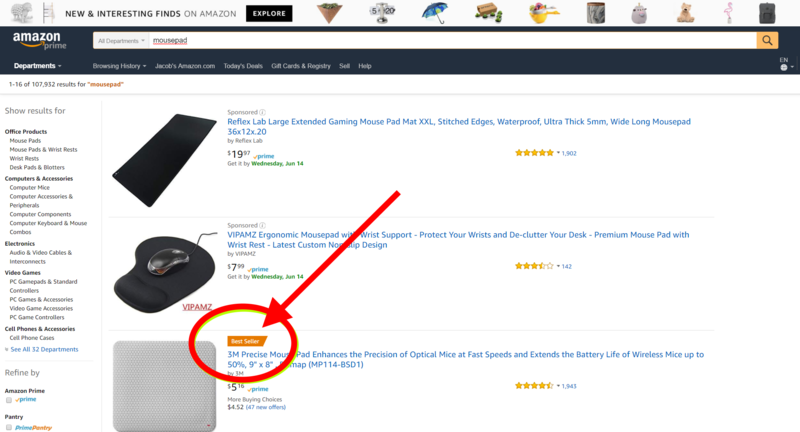 Visitors know how to scroll, so it may be find to simply list everything out, like Amazon. The question then becomes, what order? You may have success with tabs or rollout sections that reveal the information with a click. Heatmap reports will give you an idea of which sections are most important. The most important should be open by default. Sections can be ordered top-to-bottom by visitor interest. It’s important that key information is displayed pre-click, but it’s also important that non-essential information is available without being distracting. In addition to reviews, there are other forms of social proof that can be experimented with on your product pages. This could look like social sharing, displaying how many customers have already bought the product, influencer testimonials, etc. While reviews are fairly ubiquitous, other specific types of social proof might be even more powerful in your niche. 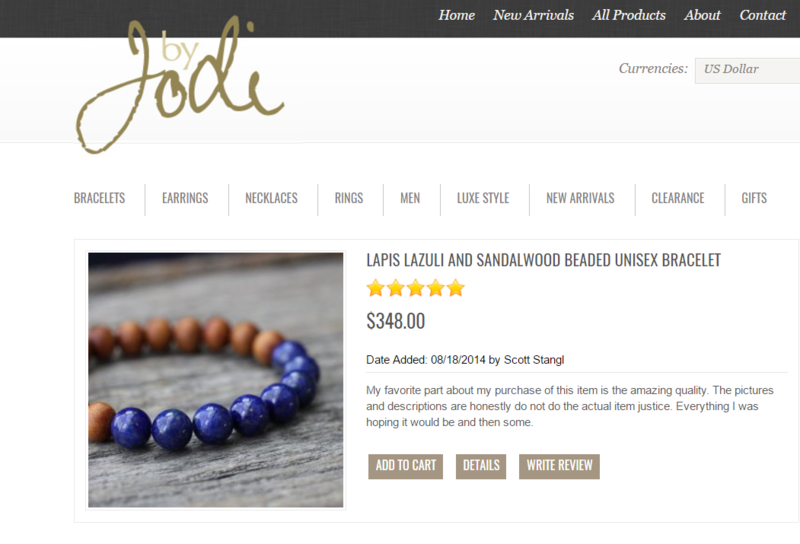 Could additional trust indicators improve your product page conversion rate? Wishlists let customers tell you exactly what to sell to them. If you don’t have a wishlist feature on your site, you should probably add one. In addition to the primary product image, it’s important to evaluate additional images and the thumbnails displaying them. Are you including enough additional images? Do the image thumbnails displayed do a good job of showing off the product? Are they in the best possible order? Are you including signs that indicate the product is scarce or in danger of running out? Whether legitimate or not, projecting scarcity on your product page can sometimes increase the conversion rate. 54. In Stock or Out of Stock? Should you include copy indicating when a product is in stock or out of stock? Should users be able to explore an image by hovering their mouse over it, or should you require them to click to explore the image? Should you display the estimated shipping time on the product page or wait until the customer begins checkout? 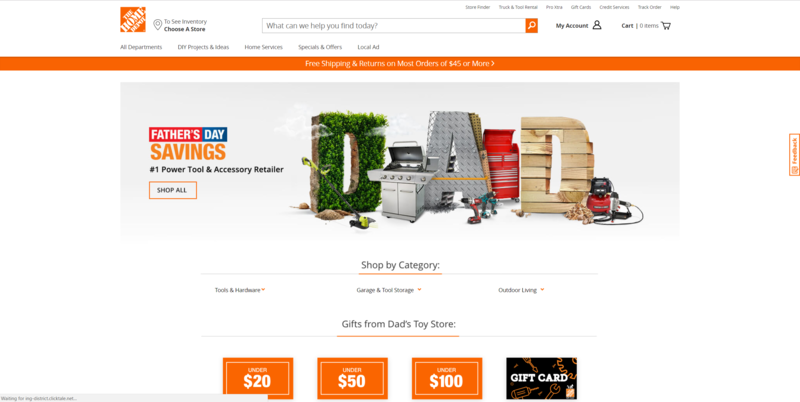 Should you display special promotions on the product page, and if so, where? Where should the Proceed to Cart or other CTA button go on the page? How big should it be? What color should it be? What should the CTA copy say? 59. Cart Page or Straight to Checkout? 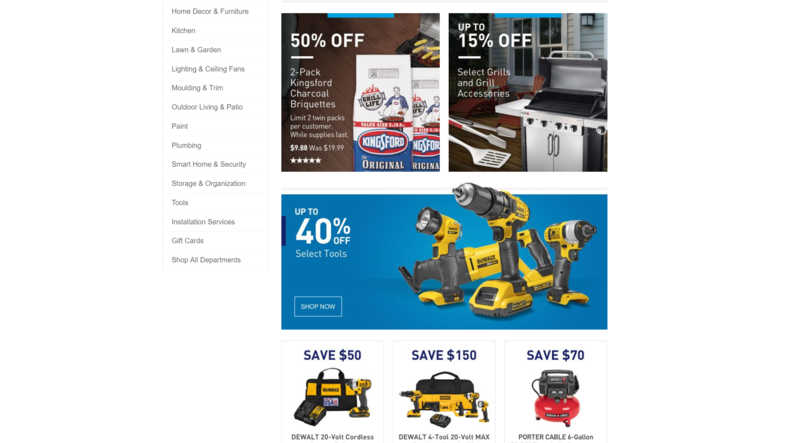 Should clicking on the shopping cart icon take users to a cart preview page or skip straight to the first page of checkout? Where should the Continue Shopping button go on the page? How big should it be? What color should it be? What should the CTA copy say? What happens when invalid discount codes are entered? Is the automated validation system bug-free and optimized to keep users engaged with the checkout process? Have you tried giving users who enter invalid codes a small, limited-time discount to encourage them to make the purchase? 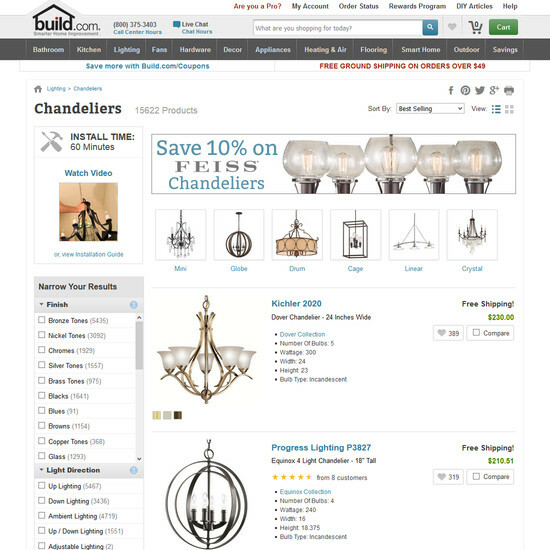 Should you include product descriptions on the cart page? If so, how long should they be? How big should the product images be on the cart page? Where on the page should they go? Can you use them as a visual cue to draw users’ eyes to your primary CTA? Should you include related items, recently viewed items, or other upsell-focused items to the shopping cart page? If so, where on the page should you places them? 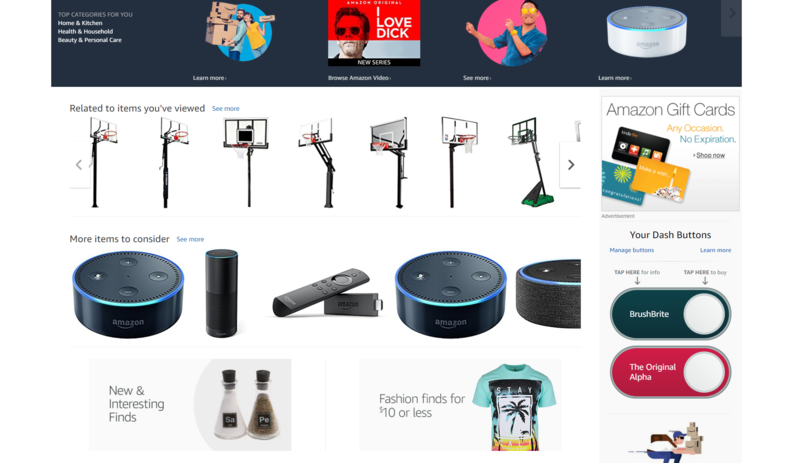 You might notice that Amazon’s shopping cart page is very monochromatic. It all sort of looks the same, and while it’s not necessarily confusing, it doesn’t draw your eyes to anything in particular. 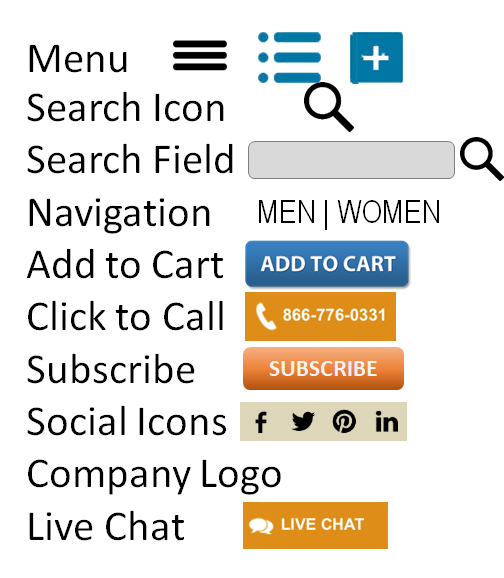 Meanwhile Yandy.com’s shopping cart has contrasting colors with a very distinct visual hierarchy. 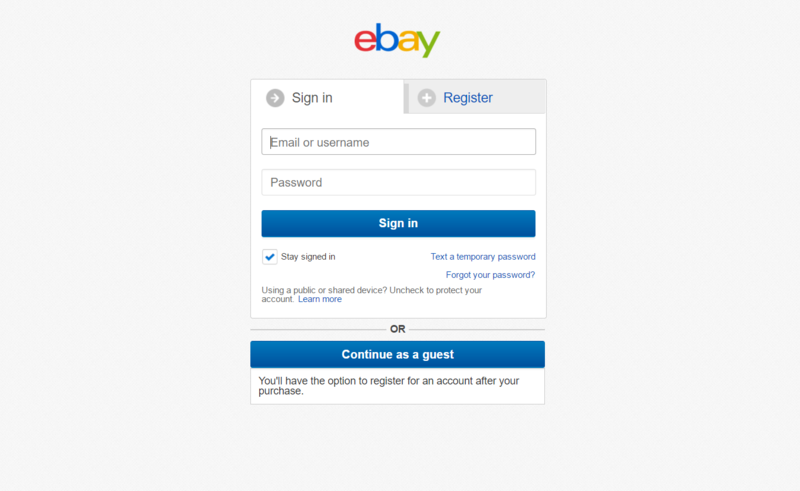 The eye is clearly drawn to the checkout box in the middle-right of the page. Which style will work best for you? Are you offering enough payment options? Are you letting your customers know about the options you currently provide? 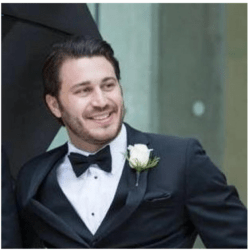 Should you make additional payment options obvious at the beginning of the checkout process like Yandy.com, or should you reveal them more subtlety when it’s time to process payment? 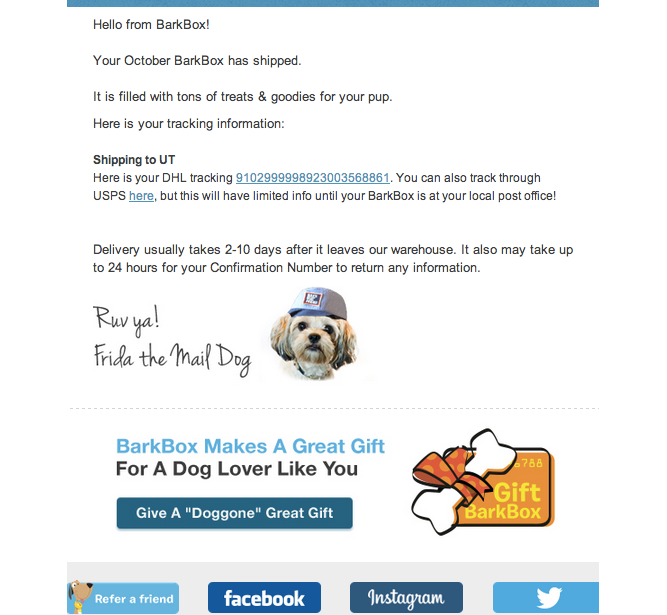 Should you reveal estimated shipping time on the cart page or attempt to use it here as a selling point? Or should you save it for another point in the checkout process? Should you display the shipping cost (or lack thereof) on the cart page or save it for elsewhere in the checkout process? 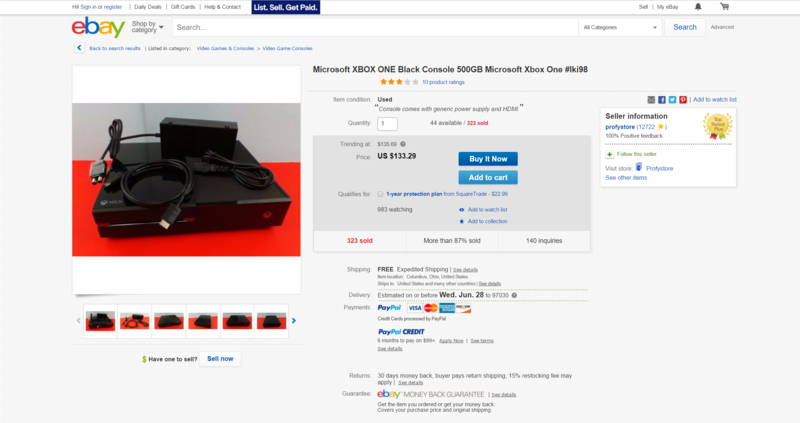 How should you display product pricing on the cart page? Should it be highlighted? Minimalized? Should discounts be displayed next to the original price? Are you including signs that indicate the product is scarce or in danger of running out? Whether legitimate or not, projecting scarcity on your cart page can sometimes increase the conversion rate. Could additional trust indicators improve your cart page conversion rate? 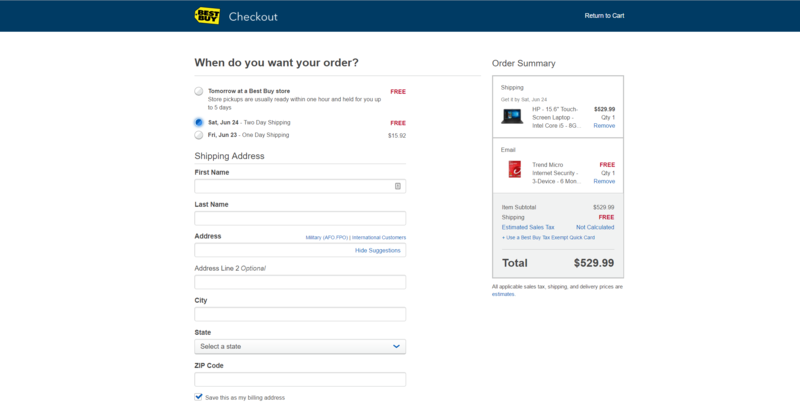 One question you have to ask is where in the checkout process (if anywhere) should navigation options be removed. Having general navigation options can sometimes be distracting and prompt cart abandonment. 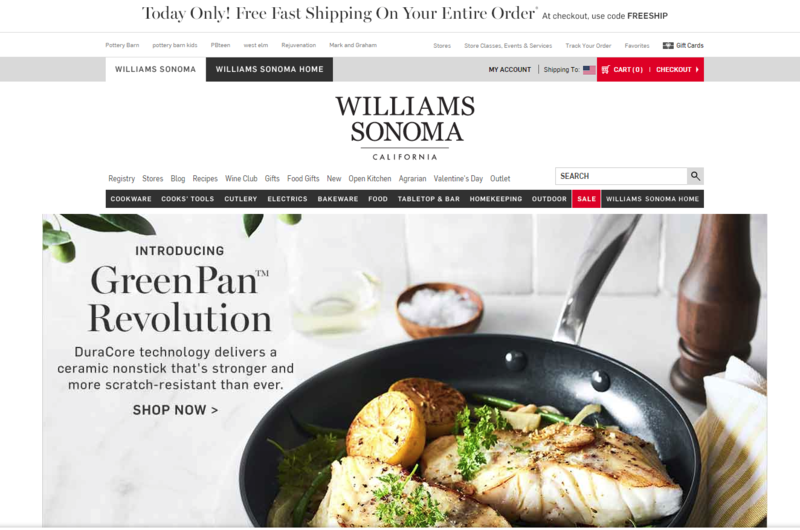 Should you remove navigation on the cart page or after users begin the checkout process? Should you allow users to enter promo codes and coupons on the cart page or wait to provide that option on the payment processing page or some other page in the checkout process? Could a redesign improve your conversion rate? 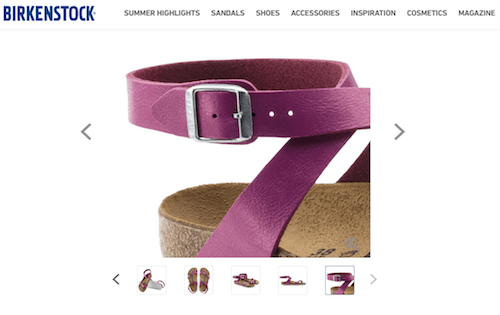 Are parts of your cart page visually unappealing? Does the page design reflect your brand? Should it be more design heavy or more minimalist? Should users be able to change the quantity of a given item in their cart from the cart page? Adding this functionality often enhances the user experience. How many CTAs are displayed on your cart page? How many should their be? Should their be multiples CTAs for the same link? Should their be multiple different CTAs? You’ll need to test to find out. 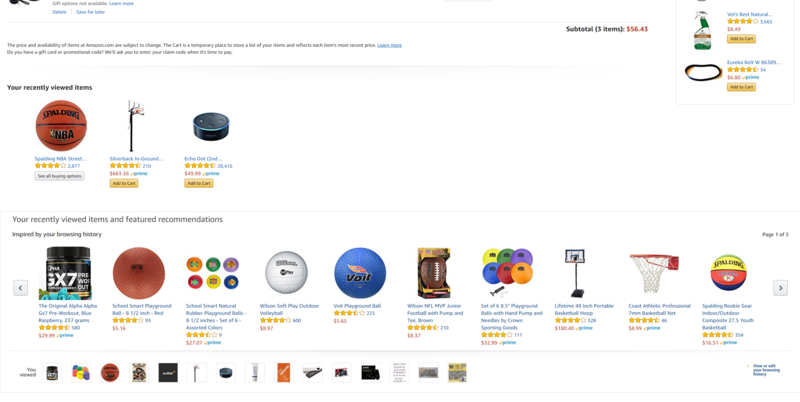 Should you provide users with the option to add cart items to their Wishlist from the cart page? Should you require all users to create an account or allow a guest checkout? Most consumers have a billing address identical to their shipping address. Including a relevant checkbox that lets them copy/paste improves the user experience. At this point, most consumers expect this feature and will be annoyed if it’s not available, potentially even to the point of abandoning the checkout process. Should you display the estimated time of arrival (ETA) before the order is placed? If so, there are quite a few different options and placements for offering shipping options and presenting the ETA. Validation errors and their accompanying notifications are a fundamental part of the checkout user experience. Any errors or sub-optimal elements can significantly hurt your conversion rate. Make sure that error notifications are obvious and specific, helping users quickly enter the correct info and proceed with checkout. The copywriting throughout your checkout process is incredibly important. It’s not enough to just write something and leave it. If you want optimal results, you have to test. 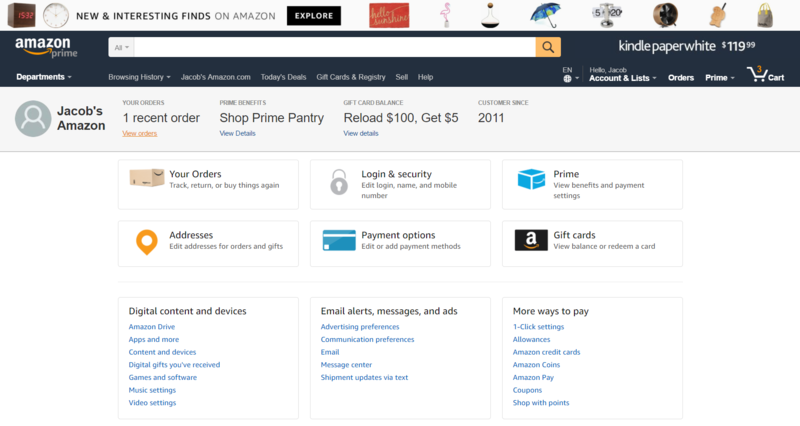 One question you have to ask is where in the checkout process (if anywhere) should navigation options be removed. Having general navigation options can sometimes be distracting and prompt cart abandonment. Removing them, however, can sometimes annoy customers. You’ll need to test before you make a call. If you make account creation optional, where should you prompt guests to create an account? Should you prompt them multiple times or just once? 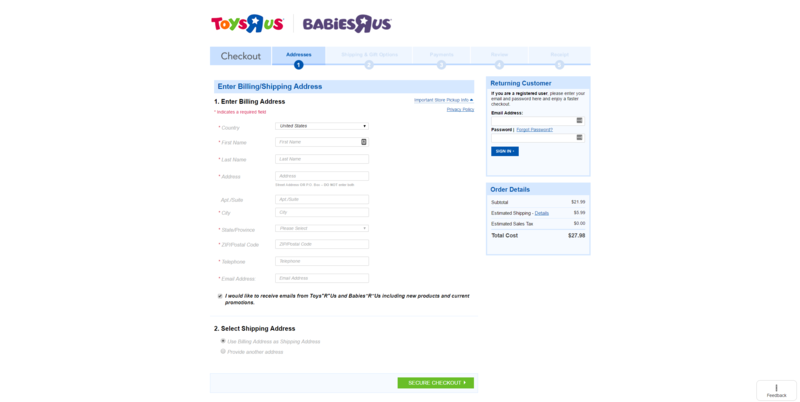 Could additional trust indicators improve your checkout conversion rate? 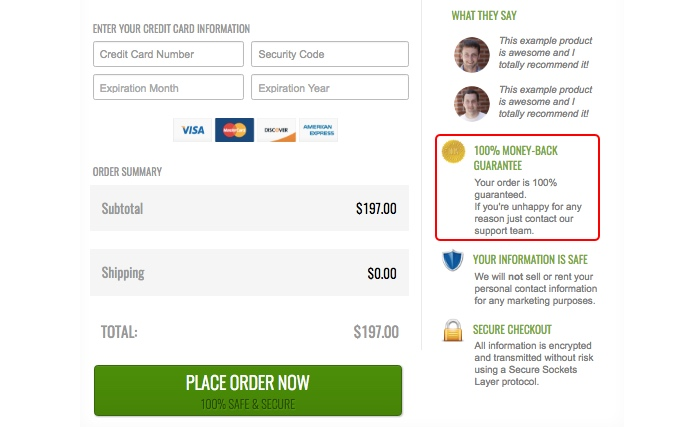 Money-back guarantees. Return policies. Quality assurance. 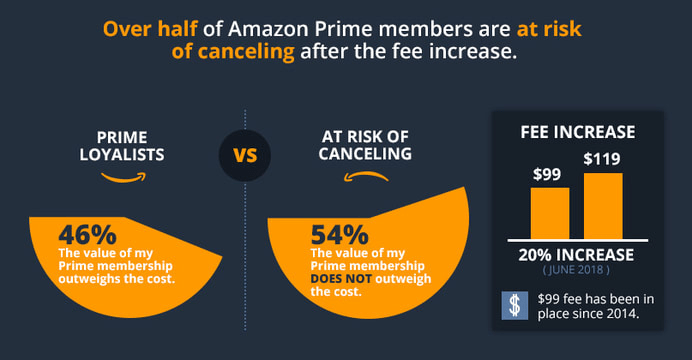 Consumers fear risk, particularly when they are first ordering from your business. Highlighting policies that lower risk for the consumer is a great way to increase conversions. Do you have a pixel collecting data on your checkout page for remarketing ads? If not, you should. When collecting data from users, there is essential data that absolutely MUST be collected to deliver the product, and then there is non-essential data that is helpful for segmentation and marketing. The first category is just a matter of optimization. How can you request that info in the best possible way? The second category requires you to find a balance. How much can you ask for without creating too much friction? There are case studies where splitting up the checkout process to multiple pages increased conversions. There are case studies where condensing the process to one page increased conversions. You’ll need to test to find out what works best for your audience. Letting users know where they are in the process and how far they have to go can encourage them to stick with you, particularly if your checkout process is longer than two pages. This can take the form of breadcrumbs or a progress bar or some other form of visual progress indication. 91. Custom Checkout or 3rd Party Solution? It used to be that a custom built checkout was the only viable solution for creating a top-of-the-line checkout experience, but that simply isn’t the case anymore. Nowadays, there are some very high quality 3rd party solutions that have hundreds of built-in integrations for any service or function you could possibly think of. In fact, if your custom checkout was built more than 5 years ago, it is very likely you will benefit from switching over to a 3rd party solution. Should you include your checkout under domain.com/checkout or checkout.domain.com? 93. 1 Column or 2 Column? Is there any significant performance difference between a single column checkout and a double column checkout? 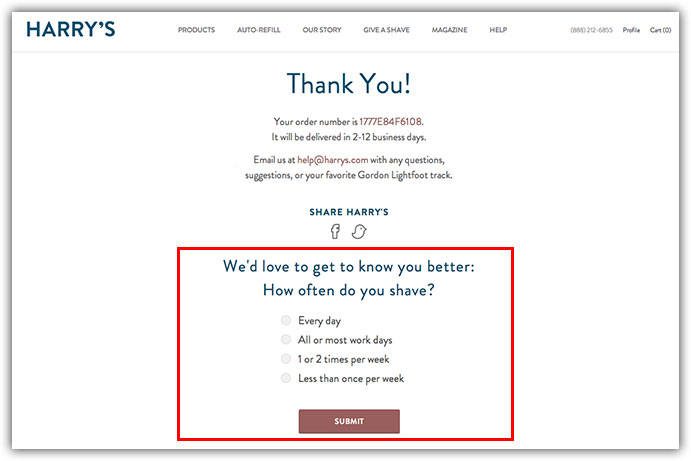 Will a sticky order summary enhance the experience for consumers and increase conversions? Telling visitors what to expect next at each stage of the checkout process can enhance trust and reduce abandonment. How can you do better at setting expectations throughout your checkout process? 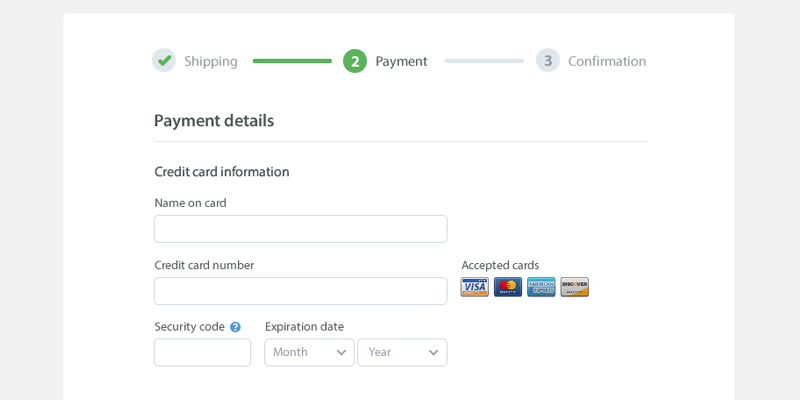 We’ve touched on CTA buttons a number of times already, but they are just as important to test within the checkout process as they are everywhere else. If you incorporate coupons and discounts into your marketing, it’s important that your promo code entry field is easy to find. The goal of virtually any ecommerce business is to create repeat customers. You want people coming back to your site as often as possible, and one way to help facilitate this is with an active dashboard that provides up-to-date information on the status of customer orders. Are you providing your customers with the information they want? The account dashboard is prime real estate for customer retention. It’s the portal through which returning customers will interact with your site or attempt to close their account. It’s a great place to have value building copywriting designed to keep them on your customer list. When was the last time your revisited this copy? The dashboard is also a great place to upsell customers with special offers and data-based recommendations. Are you taking advantage of this? Would some of your customers buy more if they had a bulk order option? For subscription revenue models, are you providing users with a clear path to upgrade or modify their subscription? Are you re-enforcing the value from within the account dashboard or are you trying to retain customers by making cancellation difficult? Converting a visitor into a buyer is really just the first step. What you do from here forward is equally, if not more important. Attempting to collect additional information about your new customer is one way to kickstart that next stage in the relationship with a better understanding of the customer. Is the most profitable post-sale option an immediate upsell? Or will that turn off new customers? This is a MUST TEST. Post-sale customers are already in purchase mode and might be in prime position for an upsell, but upselling can also backfire, so again… MUST TEST. While email addresses are often collected during checkout, that doesn’t mean customers want to get your emails. Following up with an incentivised email signup offer prepares customers to receive future emails from you that aren’t strictly order related. Certain niches attract highly engaged customers who will happily advertise their purchase to friends, family, and followers. Are you giving these customers easy access to share about their purchases on social media? Is your open graph data setup correctly so that auto-click sharing generates attractive posts? 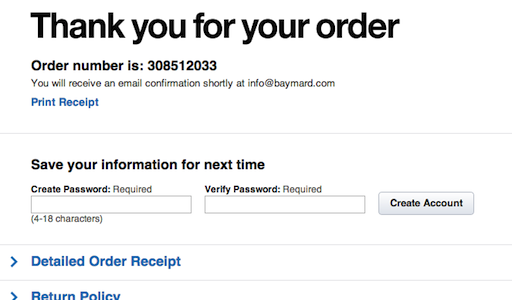 If you offer guest checkout, the Thank You Page is a great opportunity to prompt customer account creation. Is that the best use of this real estate for your business? Referrals are THE highest converting marketing channel in existence. If you can get your customers referring your product to their friends and family, you are virtually guaranteed additional customers. Have you tried utilizing your Thank You Page to encourage referrals? Everything you can do via the Thank You Page you can also do via the confirmation email. Check out our confirmation email writeup here. That was a lot to cover, and there is no way you’re going to remember it all. If you think this is something you’ll use in the future, go ahead and download the checklist PDF below. You already know that online reviews are a big deal. But what you may not realize is that you have a TON of available options for taking control of your user review profile. There are some insanely effective ways to acquire and harness user reviews in 2017, and the businesses that are utilizing these strategies are achieving absolutely insane growth. Today, we are going to cover some of the best strategies for acquiring user reviews and harnessing them to increase site conversion and growth. But first, let’s look at the data. Sometimes different metrics reveal conflicting truths about a given subject. That’s not the case with user reviews. They make a significant impact from any angle we look. Consumers spend 31% more on average when the business has excellent reviews. According to Google, business listings that have 3+ start reviews receive 87% of total clicks. Given equal pricing, guests are 3.9 times more likely to choose the higher rated hotel. Customers who view user-generated content have a 133% higher conversion rate. When you think about what a review is, you might picture an Amazon product listing, with a star rating out of 5 followed by a few paragraphs of text. That’s certainly a common version of user reviews in action, but it’s not the only one. In order to understand how many strategies we have available to us for utilizing online reviews, we need to first understand just how many different types of reviews exist. A testimonial is a review written specifically to highlight the upsides of a product and encourage those considering it to make the purchase. A testimonial is given by someone who has actually used the product, but is not intended to be an objective, pro/con analysis of the item. The goal of a testimonial is always to promote the product in question. Testimonials can be written, recorded as audio, or captured in video and often need to be actively solicited. Endorsements are essentially the same as testimonials, but instead of being given by an average user, they are given by someone with influence in the business’ niche. That influence can be as widespread as an international celebrity or as targeted as a niche blog. When an endorsement is given, the endorser’s influence is being intentionally channeled in order to encourage more people to purchase the product. In order to receive an endorsement for your product or service, you will typically need to have provided some level of value to the endorser (through your product/service or in the form of direct payment) or have an existing relationship. An on-page review system allows users to publish their reviews of your product, good or bad, directly for public viewing. On-page reviews tend to be more trusted by consumers, as they are theoretically more objective than testimonials solicited by the business. Businesses that host on-page reviews for their products are taking the risk that negative user feedback will paint their product as a dud for prospective buyers. The upside is that having a positive on-page review profile can communicate significantly more value to potential buyers than hand-picked testimonials. 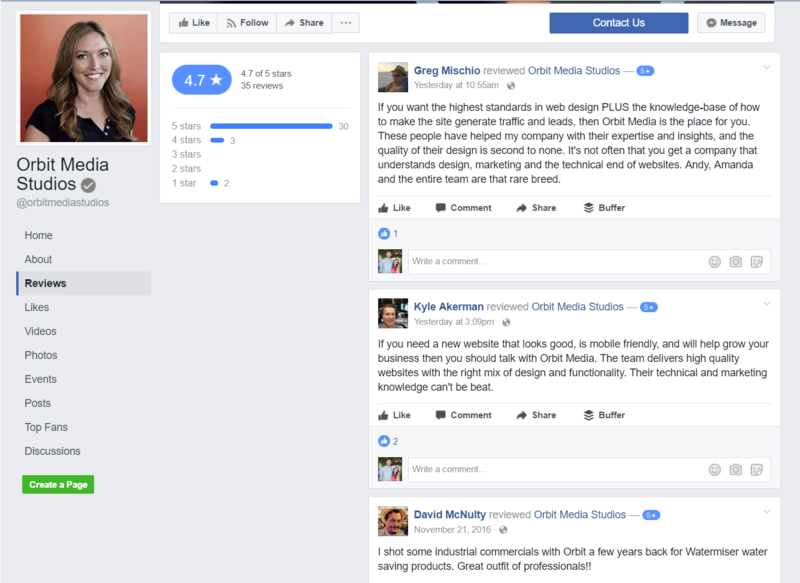 Certain social media platforms now allow businesses to open up their social pages for user reviews. Similar to on-page reviews, social page reviews can be either positive or negative and offers a risk/reward scenario for business. On sites like Facebook, reviews are prominently displayed and easily accessible. Business also have the option of disabling reviews on their page for any reason, which lowers risk in the event a page receives too many negative reviews for the owner’s liking. 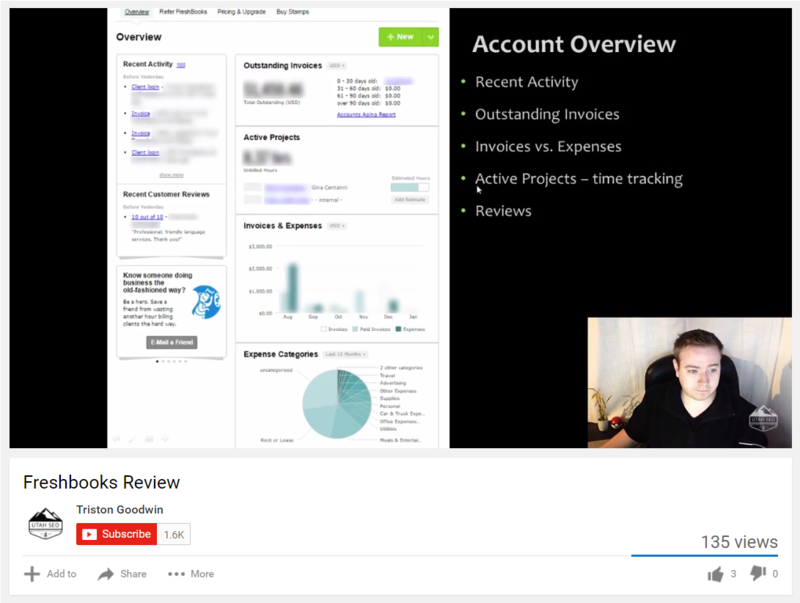 3rd party review platforms allow users to rate any business in a given category. They tend to be very popular with consumers, as 3rd party control of the site limits chances for businesses to manipulate their review profiles. Businesses are rated on these sites whether they wish to be or not, so the best course of action is usually to claim your listing, ensure listing information is accurate, and then respond to reviews. The most thorough type of review you can receive is a full blog post dedicated to breaking down your product. These take some serious investment on the part of the user, and thus, typically only happen if their is something in it for the reviewer. If your product receives a decent amount of search queries, that can be enough to prompt blog post reviewers. Affiliate programs and direct sponsored posts can also result in these types of reviews. If your product makes enough of a splash to be considered one of the top 10 or so on the market, you will probably also find yourself the subject of comparison/contrast reviews and “top _____” lists. Similar to blog posts, Youtube has become a popular destination for video reviews on a wide variety of projects. While visual items tend to perform best, anything that can be reviewed via a written post can be reviewed via video. 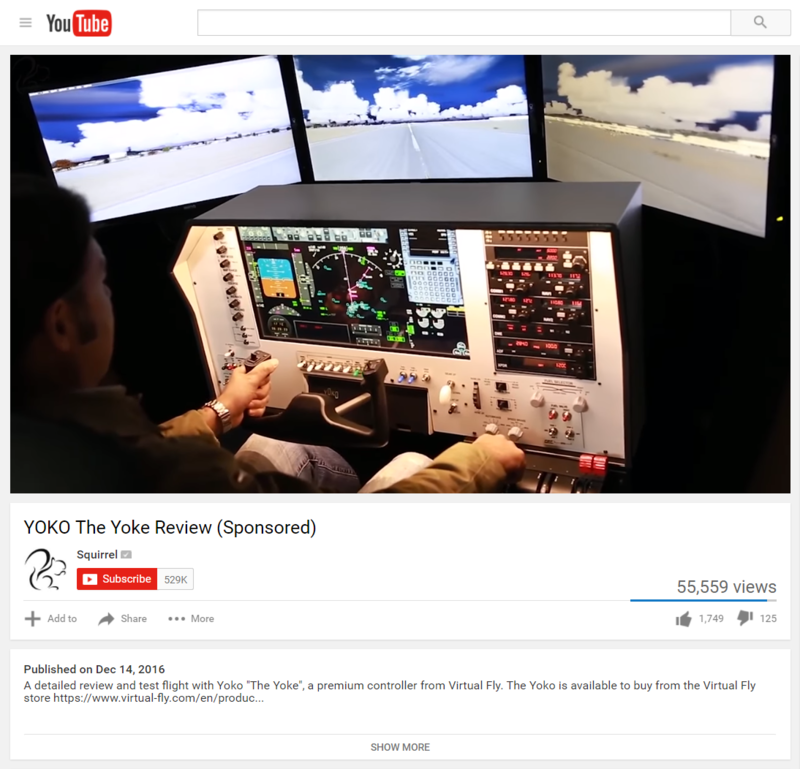 And just like blog posts, the best way to encourage Youtube reviews is to provide incentives for Youtube reviewers. So we know without a doubt that reviews can be a powerful force in our business, and we’ve seen the variety of review types you can use. The question then becomes, how can we capitalize on these reviews instead of just passively waiting for positive reviews to roll in? Or if we are actively encouraging reviews, what more can we do to harness those reviews versus just hoping they catch people’s attention? How can you collect more reviews & better quality reviews? How can you harness those reviews for the purpose of increasing conversions and driving growth? We’ll look at each objective separately. The first step to harnessing user reviews is collecting them in the first place. Here are 4 great ways to do that. 1. Ask customers for reviews during the follow up process. The easiest and most consistent way to get reviews is simply to ask for them. Give customers some time to experience your product and then include a review request in your follow up process. The timing is very important here. Yotpo estimates 8.1% of customers will respond to review requests on average, but that number can be significantly increased by optimizing the timing of your requests. While Yotpo uses machine learning to optimize send times, you can optimize open rates to a lesser extent by split testing. Do tell them what’s inside. Remember that not all reviews are created equal. If your Google My Business profile, for example, is at 3 stars, it might be more helpful to ask that users review that listing as opposed to your Facebook page. 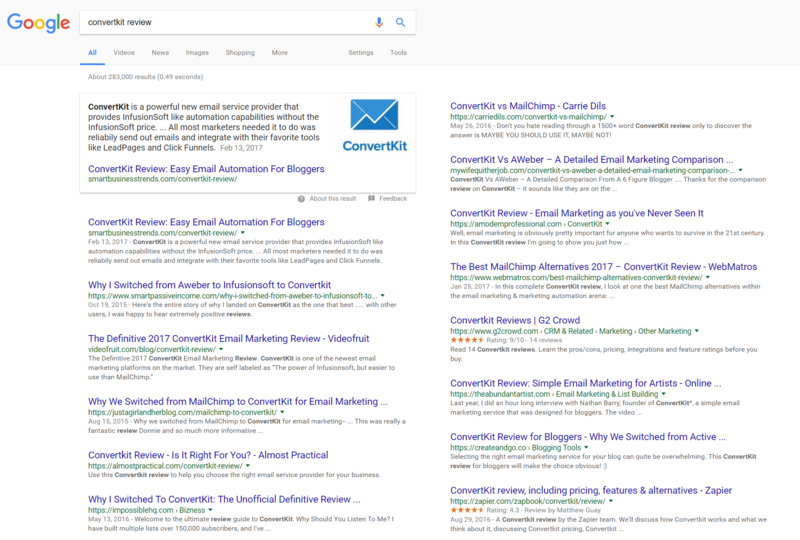 On the other hand, if very few people find your business through your GMB listing, it might be more effective to direct users to your on-page review section. It’s up to you to identify where reviews are most important and direct users there. Here’s a simple follow-up template you can use, courtesy of Grade.us – click here for 6 additional templates. Thanks for choosing [your business]. I wanted to reach out personally and ask about your experience. It’s also important that your user experience is low-friction for those who choose to click-through and leave you a review. For written reviews, you could use a plugin like Rich Reviews, or if you are interested in capturing video testimonials, you could use an app like VocalReferences. 2. Provide incentives for customers to review. One option for increasing your review count is to offer incentives for reviewers. By offering a discount, giveaway, upgrade, etc. you can encourage users who wouldn’t normally review to submit their feedback. You’ll need to be up to speed on local and national laws if you go this direction, and even then, you can only really use this strategy for your own on-page reviews or internal feedback. Trying this strategy to encourage reviews on 3rd party review sites is the quickest way to incur big-time penalties with those types of sites. 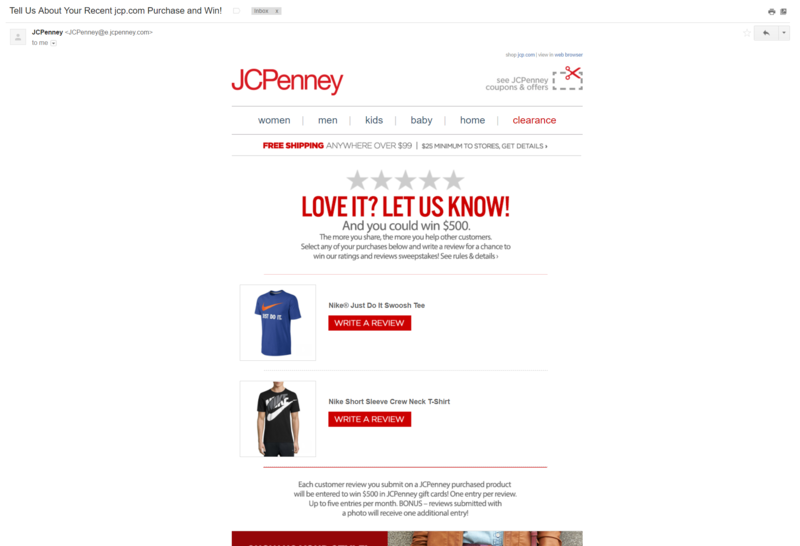 As you can see in the JCPenney example below, largest businesses often use sweepstakes entry as their reward system, since this ensures a user’s individual commentary doesn’t in any way affect their chance of winning the reward. Another great incentive that doesn’t really feel like an incentive is to hold a contest, where users compete with their own user-generated content. This works particular well with visual products or creative audiences, but it can work for a wide variety of businesses. Contests tend to work best when driven by social media marketing. 3. Send free stuff to reviewers and influencers. The best, most thorough reviews you can get come in the form of blog posts, but like I mentioned earlier, in-depth, blog-post-length reviews take a lot of work, and simply asking someone to review your product in this manner isn’t typically going to cut it. In most cases, you’ll need to compensate the reviewer, at minimum, with a free copy of your product. Some reviewers or publications that include reviews will do sponsored posts, but the best, most trusted reviewers won’t go further than accepting a copy of the product and will attempt to provide an unbiased review, for better or for worse. Unless you are a big brand with an anticipated product release, you probably won’t be able to get the top reviewers in your niche. Instead, you’ll want to focus on finding influencers with small but highly engaged audiences. This approach is very targeted, and while it can scale, if you are looking to scale from the start, there is a better option. 4. Setup an affiliate program. Creating an affiliate program is the easiest way to incentivize every single blogger in your niche at the same time. Everyone has equal opportunity to cash in on your company’s buzz by writing reviews and adding affiliate links. Unlike sponsored posts, bloggers don’t have to explicitly state that they are writing the article with that incentive in mind. All they are legally required to do is acknowledge somewhere on their site that they include affiliate links on their site. Since affiliate marketing is so commonplace, most readers won’t interpret the presence of affiliate links as a suggestion that the review is biased, which is less the case with sponsored posts. In other words, if you can get people active in your affiliate program, you end up getting the best of both worlds. This model is particularly effective for services that require month-to-month payment. For example, ConvertKit chose from the get-go to put it’s growth stock on the affiliate train. They offered 30% recurring affiliate revenue (more than any of their competitors) and then got some big time affiliate marketers on board. If you search for reviews, you will find page after page of blog posts promoting their product. These reviews were instrumental in driving ConvertKit from a failing company at the beginning of 2015 to $518,000 MRR to close out 2016. And as a user of ConverKit since 2015, I can tell definitively that it’s not the quality of the product or even the marketing that is driving growth. It’s a solid product, but what has ultimately been the key driver in its growth is the exponential effect of a well-run affiliate program. So we have our reviews now. What do we do with them? What can we do with them? Every business model will work a bit differently, but the following three strategies can be applied to virtually any business. 1. Include positive reviews throughout your funnels. The easiest way to use reviews is simply to plaster them all over your funnels, and you should absolutely be doing that. There are few better ways to improve site conversions than by adding generous helpings of social proof. And while you no doubt understand how to add a testimonial or review to a landing page, you might not realize how effective it can be to add these reviews to your checkout pages as well. 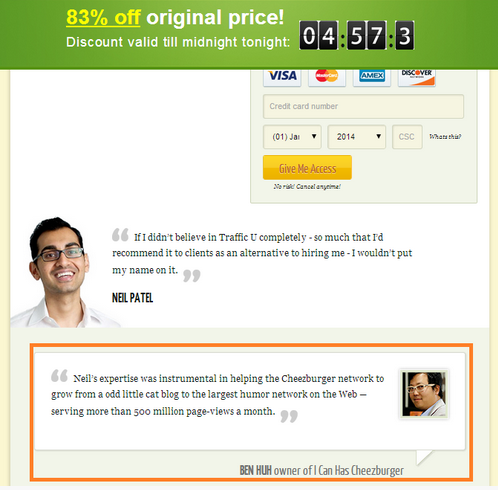 Neil Patel found that just adding a testimonial to his checkout page increased conversions by 6.38%, without any additional optimization. 2. Drive the narrative by responding to good & bad reviews. People don’t like to be scammed. They don’t like receiving poor quality products. They don’t like bad service. They also don’t like seeing hard working business owners abused. People understand that there are many consumers out there with unreasonable demands and a penchant for unfairly flaming any business that doesn’t submit to their insane demands. When you are actively engaged with user reviews, you can help drive the narrative about your business instead of having it swept away by individual consumers. You can thank those who leave positive reviews and invite them to purchase form you again. 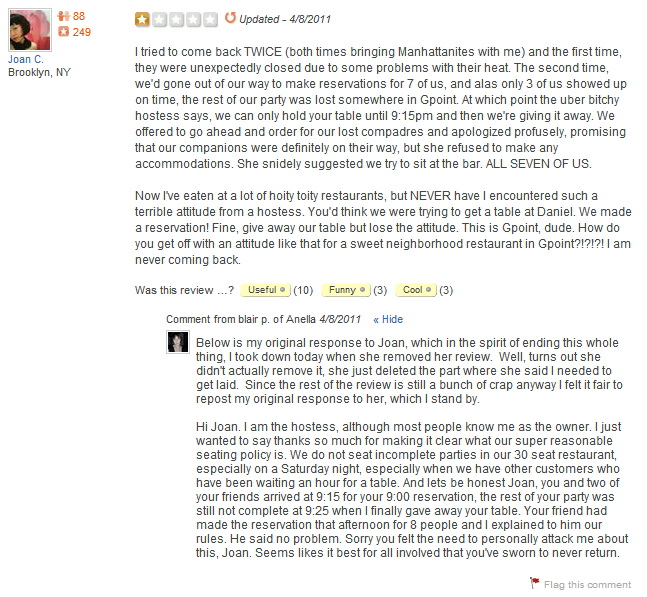 You can respond graciously or cheekily to the ridiculous reviews. And you can learn from the reasonable negative reviews. This will look different for every review type we’ve discussed. For blog posts reviews, you could thank the reviewer for posting and answers questions from readers in the comments. For reviews on your own site, you could make special offers or engage in other forms of customer appreciation. By being active with reviews instead of passive, you can help shape the narrative on your brand. This is perhaps the most overlooked strategy here. When someone positively reviews your brand, they are in a prime position to be upsold. They have literally gone out of their way to mention how great you are or how positive their experience with your brand has been. Now is the time to move them to the next level in your funnel or simply offer them a refill, additional item, or any other form of upsell. Having great segmentation is important here. Your upsell pitch needs to be hyper-relevant the the reviewer. And how you attempt to upsell will depend on the nature of the review. If you are requesting a review via email, you could include an upsell offer directly under the review request. You could also track reviewers and include them in a separate follow up sequence that attempts to upsell them later. For blog posts or youtube reviews, you could offer a special discount to viewers. There are a lot of possibilities. The only area you will need to be careful with is 3rd party review sites, as they probably won’t want you using their platforms for upsells. User reviews are a big deal, and harnessing them can have a major impact on website conversions and overall business growth. I hope you’ve found our comprehensive overview helpful today, and I’d love to hear if you have any additional review strategies that have worked out for you. Let me know in the comments! Ecommerce is a now a $2.35 TRILLION pie. It’s big. It’s getting bigger. And it’s why we’ve spent a lot of time over the last few years talking about ecommerce optimization. For many new and even established businesses, however, the problem is less about conversion and more about getting people to your website in the first place. You need a consistent means to drive targeted traffic to your store. To help solve this problem, we’re bringing you the following infographic from Visiture, highlighting the 3 most effective eCommerce marketing strategies in 2017.